Home > Power Players > Power Player – Sarah J. Power Player – Sarah J. 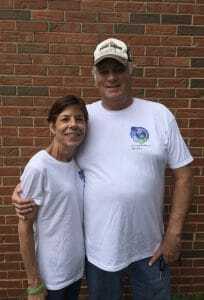 For Sarah and Jim Jones, a journey that would lead to a liver transplant and the start of a non-profit to help others began in 2002 when Jim was diagnosed with kidney cancer. Soon after Jim was diagnosed with kidney cancer, he had his kidney removed. However, just a few weeks after the surgery, he was diagnosed with end-stage liver disease. Jim needed a liver transplant but was told that he had to be cancer-free for five years before he would be eligible for the transplant waiting list. It was a long five years to wait, but Jim’s medical team was optimistic that he was healthy enough to survive. Finally, five years passed, and Jim was cancer-free. It was time for the family to enter the next stage of the journey – the waiting list. Jim spent eight years on the waiting list. 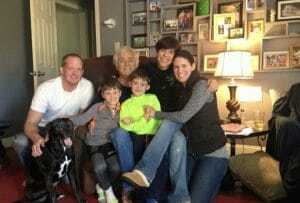 It was difficult for the entire family, as Jim had a medical condition called Hepatic Encephalopathy, which causes a loss of brain function when the liver does not remove toxins from the blood. Jim was unable to work or be left alone, so Sarah became his primary caregiver. Being a caregiver is one of the unrecognized burdens of the process. Jim and Sarah live in a small town in Tennessee, a significant distance from any transplant centers. They lived in a hotel for six months and then rented a small house so Jim could have access to the center. That experience made them realize that help was needed in the area of housing for transplant patients. “There are a lot of germs in apartment complexes,” Sarah noted as an additional barrier for housing. Jim received “the call” in January 2014. It was the middle of the night, and he was told to go to the hospital for surgery in the morning. Jim went back to sleep, but there was no way Sarah was getting back to sleep after that news. “I already had the bags packed and ready to go,” she said. While Jim was waiting for his transplant, the family started an organization called Caring Hands Village. Their goal is to purchase small homes near transplant centers for those in need of a place to stay. Their vision is to create a village of 2 bedroom homes with a main house for socializing and eating meals together. It would also be a place of relief for caregivers. The first two years post-transplant were difficult for Jim. The required medications were hard to adjust to, but he’s back to working full time as a traveling salesman. 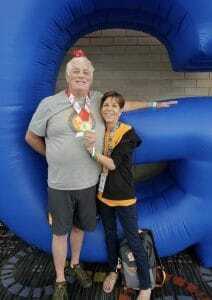 He also participated in the 2018 Transplant Games of America. The family does everything they can to promote organ donation, including sharing their story through speeches. “We are walking, talking billboards,” Sarah said. This wasn’t Sarah’s first time being a caregiver. She previously cared for her mother, father, and best friend. Sarah said that social media saved her while caring for her husband. She joined a support group on Facebook and met a network of people who got her through the process. One woman who she had never met in person, came to the hospital during the transplant surgery and sat with Sarah while she waited. Never miss a story. Sign up for our mailing list.